Pa Pa Walk may be hard to find because it’s tucked behind an elevator shaft on a strip mall on Valley, but it’s worth it on a hot day. It’s a small restaurant serving Taiwanese diner dishes like rice with sausages, noodle soups, stinky tofu, and dumplings, but what I really was there for was the shaved snow aka 雪冰. It’s different than shaved ice because it’s condensed milk frozen solid, and then shaved. The mound of shaved snow can be topped with different fruits and items (like red bean and grass jelly), and then in case you don’t think it’s sweet enough, another squirt of regular condensed milk. It’s syrupy sweet, cold, soft, and icy. 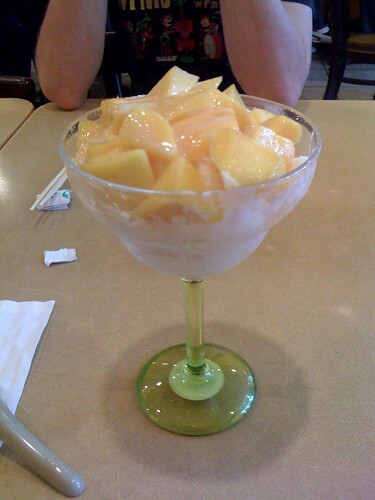 I’m not usually a fan of overly sweet things, but a mango shaved snow sure hit the spot this weekend. While we were in New York, the BF and I walked by a small window display full of old, vintage soda bottles which caught my eye. When we examined it further, a friend who was with us told us it was a vegan ice cream shop. Unfortunately, it was closed at the late hour we walked by, but we made note of it to return later. The next day, we walked into the ice-cream shop and ordered an ice-cream sundae even though it was about 20 degrees outside. The shop was warm, there were a handful of cheerful people talking to the woman behind the counter, and we wanted a place to rest our legs. There was a scoop of banana-flavored ice-cream and some sort of peanut butter one on top of a warmed brownie, if I recall correctly. It was topped with rich, coconut-milk based whipped cream and a radioactive-red cherry. The brownie was incredibly sweet, as well as the ice-cream, so if you have a fierce sweet tooth, this is the place for you. Even though I don’t usually like whipped cream, I really liked the coconut whipped cream, probably because I love coconut. The only disappointment about the sundae was the cherry on top. It was one of those generic, bright red cherries you’d get in jars at the supermarket. 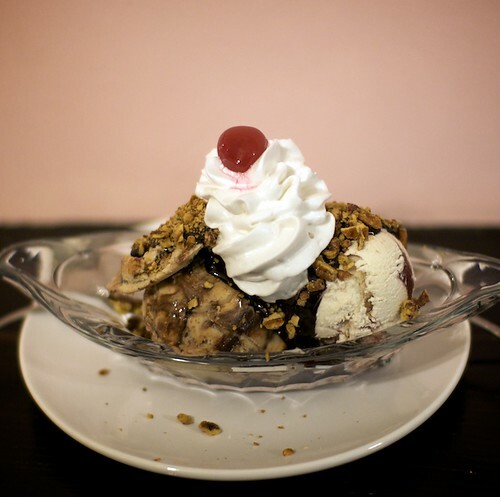 If that weird chemical flavor is something you’re craving, it certainly fits the craving, but I’d rather have a house-made brandied cherry any day, especially now that I found out how easy they are to make. Grass Jelly Fixes Canker Sores! I’ve been eating too much hot qi food lately. I ate a handful of lychee, not to mention a bunch of spicy stuff, and mango. So naturally, I got a canker sore in my mouth from all that hot qi. That’s why I bought a can of grass jelly from the Chinese market this weekend. That and it’s just a refreshing dessert to have around in the summer. 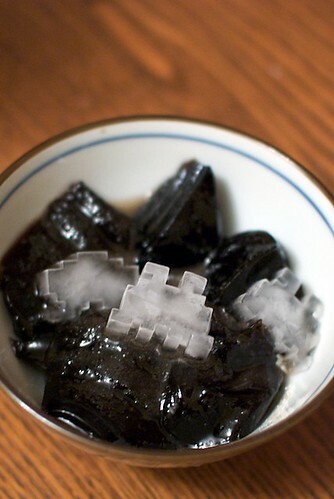 I prepare it in a simple way: a couple cubes of grass jelly, a few ice cubes, and a sprinkle of sugar. That’s the way my mom used to serve it, so it’s the way I’m used to eating it. Not a lot of people like the taste of it, but I’ve grown to like it.